Corey, James S.A. Strange Dogs. Orbit, 2017. 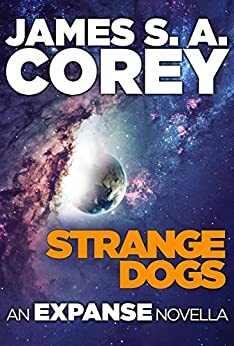 I am of the considered opinion that this little novella represents a return to form for Abraham and Franck (aka “James S.A. Corey”), as they retreat from the flamboyant villainy of Marco Inaros into something much more provincial, as it were. Of course, the tale they tell has important implications for future Expanse novels: it helps show the broad outline of the threat—and opportunity?—Holden, Nagata et al will soon face from the rogue Martian operations led by Duarte. Since, up until this point, Duarte and his entire world has been shrouded in an impenetrable veil of mystery (from the perspective of the Roci’s crew), it was a great decision by Abraham and Franck to: a) take us behind that veil, and b) hang the story around a child (of limited but growing understanding), who sees the world through (relatively) innocent eyes. When this child encounters the arch-nemesis of the solar system, Duarte, in the flesh, she of course knows nothing of his infamy, and finds him kind and accommodating. And when the child stumbles upon some of Duarte’s top-secret experiments, she finds them rather less monstrous than the reader has been conditioned to expect. That’s why having the story be told through a child was such a good idea: she doesn’t have any pre-conceived notions that proto-molecule tech = evil, and as a result, is able to see opportunities denied to those more judgmental adult humans who have encountered proto-molecule hybrids in the past. Is it perhaps fair to say that the only ‘evil’ in the proto-molecule is the foul intentions of the humans (like Jules-Pierre Mao, etc.) who sought to use it for their own ends? Like Zeus’s brainchild Athena, this review sprang fully formed from the mind of Zhaoyun, a devotee of speculative science fiction (even more than space opera!) since time immemorial and contributor to Nerds of a Feather since 2013.